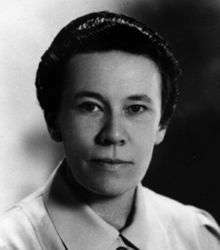 Katherine Esau (3 April 1898 – 4 June 1997) was a German-American botanist who received the National Medal of Science for her work on plant anatomy. Esau was born in Yekaterinoslav, Russian Empire (now Dnipropetrovsk, Ukraine) to a family of Mennonites of German descent, so-called "Russian Mennonites". She began studying agriculture in Moscow, but after a year her family was prompted by the Bolshevik Revolution to move to Germany where she completed her studies at the Agricultural College of Berlin. The Esau family moved to California in 1922, where Esau worked for the Spreckels Sugar Company on sugar beet resistance to curly top virus. She resumed her education at the University of California, Davis, where she achieved her doctorate in 1931, joined the faculty, and remained until her retirement at age 67. Esau was a pioneering plant anatomist and her books Plant Anatomy and Anatomy of Seed Plants have been key plant structural biology texts for four decades. Her early work in plant anatomy focused the effect of viruses on plants, specifically on plant tissue and development. Esau worked at the University of California, Davis as a teacher and later a professor of Botany. While teaching, she continued her research on viruses and specifically phloem, the food conducting tissue in plants. Her treatise, The Phloem, was published in 1969 as Volume 5 of the Hand-buch der Pflanzenanatomie. This volume has been recognized as the most important of this series and a definitive source of information about phloem. She was elected a Fellow of the American Academy of Arts and Sciences in 1949. In the 1950s, she collaborated with botanist Vernon Cheadle on more phloem research. In 1957, she was the sixth woman elected as a member of the National Academy of Sciences. In 1963, she was promoted to full professor at Davis. After retiring from the University of California, Davis, she moved to the University of California, Santa Barbara in 1965, and continued her research well into her 90s, publishing 162 articles and five books. When asked by Elga Wasserman to reflect on her education and career, Esau wrote in 1973 that scientific activities dominated her career and added, "I found ways of maintaining spiritual independence while adjusting myself to established policies. . . . I have never felt that my career was being affected by the fact that I am a woman." In 1989, President George Bush awarded Esau the National Medal of Science. In memory of her contributions as a lecturer, author and scientist, the Katherine Esau Award is awarded to the graduate student who presents the best paper in structural and developmental biology at the annual meeting of the Botanical Society of America. Esau, Katherine (1953). Plant Anatomy. (2nd Edition 1965; 3rd ed. 2006). McGraw-Hill, New York. Esau, Katherine (1961). Plants, Viruses, and Insects. Harvard University Press, Cambridge. Esau, Katherine (1969). The Phloem. (Handbuch der Pflanzenanatomie, Histologie Band 5, Teil 2). Gebrüder Borntraeger, Berlin. 1 2 3 Evert, Ray. "Katherine Esau". Biographical Memoirs. National Academy of Sciences. Retrieved 15 October 2013. 1 2 3 Wasserman, Elga (2000). The door in the dream: conversations with eminent women in science. Washington, DC: National Academy of Sciences, Joseph Henry Press. pp. 33–34. ↑ Pigg, Kathleen (2008). "Esau, Katherine". Complete Dictionary of Scientific Biography. 20: 413–416. ↑ "Book of Members, 1780–2010: Chapter E" (PDF). American Academy of Arts and Sciences. Retrieved July 29, 2014. ↑ "Guide to the Katherine Esau Papers". University of California, Santa Barbara. ↑ "The Katherine Esau Award". Botanical Society of America. Retrieved 15 October 2013. ↑ Freeman, Karen (18 June 1997). "Katherine Esau Is Dead at 99; A World Authority on Botany". The New York Times. Pigg, K.B. 2007. Katherine Esau. in New Dictionary of Scientific Biography, N. Koertge ed. vol 2: 413-416, MacMillan, New York.